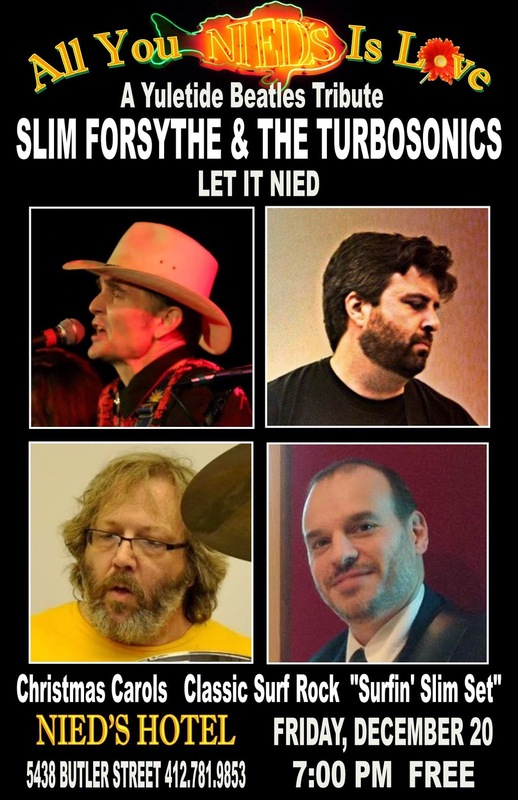 Slim Forsythe and The Turbosonics celebrate the Holidays! Here's a clip from last night's Beatles Tribute show at Nied's Hotel with Slim Forsythe. The Turbosonics and Slim did their best impression of four fab lads from Liverpool. It was standing room only and it was quite a show! Saddle up pardners and mosey on down to ye ol' Nied's Hotel in the Lawrenceville neighborhood of Pittsburgh, PA. On December 20, 2013 your local surf-rock heros, The Turbosonics, will join Slim Forsythe for the annual Surfin' Christmas Party. This year we're doin' a Yuletide tribute to the Beatles. You won't want to miss it. See y'all there, and have yourselves a Very Merry Christmas!